Mt. Madonna Road has never been paved its entire length. Check it out. You can still lose yourself in dirt out in the wilds of the Santa Cruz Mountains on a road called Summit. I’ve been riding here since the early 1980s when Jobst Brandt showed us the way from his home in Palo Alto. It’s a long ride from there, but distance never stopped Jobst from finding dirt roads. Over the decades I’ve seen changes, the most important one being no more hassles. When the Redwood Empire logging company hired a fine East Bay attorney to plead their case back in 2000, they put to rest the notion that Summit Road was private. It’s anything but. I prefer the northern approach, taking the paved Mt. Bache/Loma Prieta roads. Once at the top of the steep climb, Monterey Bay shines like a beacon to the southeast. Spread out on the flats there’s the agricultural mecca of Watsonville. Summit rolls up, down, up, down for eight miles, staying at about 2,900 feet altitude. The climbs aren’t long or steep, just numerous. You’ll be joined by 4-wheel-drives going by, a lot more than decades ago. People keep moving out here, living off-grid and enjoying their privacy. How much longer this will last is anyone’s guess. However, with more people comes gentrification. One of these days Summit will be paved. You can bet on it. One thing you’ll notice out here is the lack of dense tree growth. Blame it on frequent fires. Too many to count. The road is a vital fire break. I headed down the paved Summit to Mt. 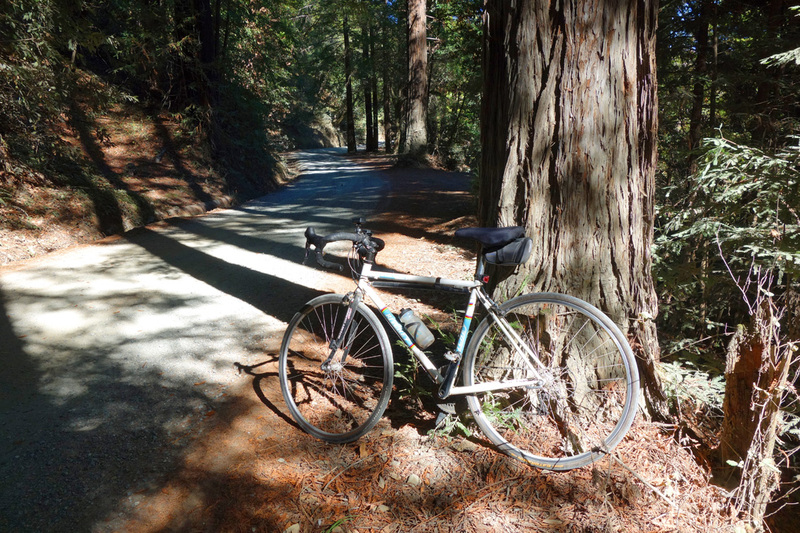 Madonna Road, one of the nicest stretches you could ever hope to ride in the Santa Cruz Mountains. It’s worth the effort. There’s another 1.3 miles of dirt on Mt. Madonna Road heading north. It’s darn steep and gravel. Use caution. Heading back on Uvas Road I checked out the old road, fully exposed now that the reservoir has dried out. Let’s hope for rain. This entry was posted on October 14, 2014 at 7:01 pm and is filed under Ride reports. You can follow any responses to this entry through the RSS 2.0 feed. You can leave a response, or trackback from your own site. The road must have been greatly improved since I took the ride. As I remember it, it was mostly downhill from the top of Loma Prieta into Mt. Madonna Park, but I couldn’t just coast down – there were rocks and cracks for most of the way, so I was constantly on my brakes. I remember thinking, it would be much more enjoyable in the other direction, when I would be going slowly anyway. But I also remember, there was no traffic at all – no bikes, and certainly no four-wheelers, until I finally got close to the Park. I think I rode there once from the valley about 25 years ago. I couldn’t do it now. You are very impressive to have the desire and to have maintained the range you have for 30+ years. I’ve ridden up Mt. Madonna Road several times and have always wanted to continue north on Summit but thought that the road was private. It’s great to know that this road is open. I can now envision a ride up Mt. Madonna Road, along Summit, down Loma Prieta Way and Mt. Bache, along Highland, down San Jose Soquel Road to Redwood Lodge Road, up Schulties, down Old SC Highway, through Los Gatos, and back to my home in San Jose. Lots of dirt and few cars! It’s public, public, public. No worries. They will not bother you. Those no bike signs are left-overs from prior to the lawsuit. Note that in the decision the section of Summit Road in question is not said to be publicly owned, just that public use is allowed under ‘an implied dedication’. If I understand the legalese, the reasoning seems to be that unopposed public use by a variety of groups of a road on private land for at least five years ends up creating a public easement. What puzzles me is that signage stating that Summit is private would be allowed to remain in place. Why doesn’t the county remove them? I’m not so sure those signs were installed by the county. I’ve been meaning to do it this year. It has been nearly 2 years. Rode it just today, from the northeast. My group rode only 1.5 miles into the supposedly private portion (past the signs at Maymens Flat), due to lack of time. Encountered a few drivers passing by during that time. Received no special reaction from any of them. The signs barring entry and bikes are still up though. I held back saying anything, but I can’t say it’s all that interesting as roads go. Loma Prieta Road is the crown jewel in this area, and one day it may even be open to the public. I want your false article corrected. GOOGLE Burch v. Combos for the lawsuit that deemed Summit Road to be PRIVATE. We won the lawsuit against Redwood Empire, and the Landmark Case is used constantly today. Nothing you state is correct. We hired lawyers in 1995, not 2000, and Redwood Empire and Roger Burch LOST the case. That’s not how I read the legal summary. People can draw their own conclusion: https://rayhosler.files.wordpress.com/2011/03/redwood_empire_summit_road_public.pdf. All I can say is that after the ruling I was never harassed while on the road. LOL. You are telling the person who instigated the lawsuit how it was decided? I no longer live there and have no idea what signage is on the road now. I moved in late 1999, and the lawsuit was settled via Redwood Empire pay out in 2001, 2002. Also, you do not tell a member of the litigation what to look at. You are WRONG. Get your facts straight and remove the lies you have posted. GOOGLE “Burch v. GOMBOS” for case law and correct the lies. In the above, appellants are you and your neighbors, respondents are the logging company. Do you have a more recent appeal that suggests the courts decision was reversed? As far as I can tell, while some of the land the road is on may be private, access to the road is open to the public. The trial court found that the portion of the road in issue has been impliedly dedicated to the public as a result of public recreational use of the road in the 1950’s and 1960’s. The court enjoined appellants from interfering with respondents’ use of the road, and denied appellants’ cross-request for injunctive relief. We will affirm the trial court’s ruling granting injunctive relief to respondents because the court correctly concluded the roadway is now public and it is inappropriate for appellants to engage in “self-help” to restrict the type of public usage. Nowhere does the court ruling mention the outcome of the logging operation and I can’t find anything by searching Google, beyond what I post here. I have never before stated this to someone. Something is WRONG with you, and you are a very STUPID person. You are taking a statement out of CONTEXT. Different decisions came down during over seven years of litigation. Either correct your lies, or I will have the main lawyer for the case contact you. Learn to read CASE LAW. SUMMIT ROAD WAS DEEMED PRIVATE and you are an IDIOT. I don’t like having to say that, but I have a feeling you must either have a tie-in with Roger Burch and/or Redwood Empire. What you are trying to do ILLEGAL. DO YOU UNDERSTAND? IT IS ILLEGAL TO MAKE UP AND CHANGE DECISIIONS DECIDED VIA COURT AND TRY TO SPREAD LIES ON THE INTERNET. This is the LAST TIME I WILL DISCUSS THIS WITH YOU. You will hear from a lawyer next time. UNDERSTAND? Get your outright lies off this site and post a correction. The next time this is explained to you, it will be via a lawyer. The injunction entered against appellants is affirmed. The denial of injunctive relief in favor of appellants is reversed, and the matter is remanded for further proceedings consistent with this opinion. The parties shall bear their respective costs on appeal. No. H019557 is what is called a LANDMARK case and has been used across the USA in determine LEGAL PRIVATE ROAD rights for homeowners. How dare you question and lie about a decision such as this and try to fight with the main person involved with the litigation. I want a retraction posted immediately. Upset? You bet I am that I have had to explain this to you over and over. Just looked at some of the comments above. The lawsuit didn’t originate at the Maymen’s Flat end of the road. No one here knows anything about the lawsuit. It originated due to illegal Gamecock Canyon logging and THP at the Mt. Madonna end of the road. Lots of opinions above, and not one person that knows any facts whatsoever. Shame on every single one of you for making fun of a subject and court decision you know absolutely nothing about. Your “explanation” consists mostly of personal attacks. A typical tactic of those trying to intimidate others. I’ve made no claims as to the circumstances, e.g. which end of the road, that triggered the original law suit by Redwood Empire or those that caused you et al to appeal. We must remand to give the trial court the opportunity to make the initial determination as to whether Redwood Empire’s logging operations are within the scope of the public easement. I don’t know, and find it only a matter of academic interest, whether the trial court subsequently determined that logging was permitted by the public easement. But public use of this road, i.e. hiking or biking, clearly is. All of the uses described in your email support a long term public use and therefore, in the case of a private road, a finding of a easement for pubic use. If you consider a woman, and past member of very extensive litigation, saying that you that are wrong in your conclusion that a road is “PUBLIC” when it is actually “PRIVATE”, to be hurling a personal attack at you, then go ahead and think that. There is not ONE PERSON in this entire thread that knows how to interpret and/or read a court decision, or road signage. Not one single person. I am assuming that most of you are above the age of 18, and are considered adults. You should be ashamed of yourselves. You not only don’t know how to interpret very simple wording and language, verification that the road is PRIVATE from a member of the litigation, you break laws and trespass onto PRIVATE PROPERTY and laugh at the consequences. You outright IGNORE signs as verified above. This is, without a doubt, the most uninformed, uneducated and outright dense group of people I have ever encountered. That’s about as clear as it gets. Summit Road is a private road with an implied dedication of a public easement to use the road. This gives the public the right to use the road, certainly for the recreational purposes described in the litigation. I for one appreciate the efforts of all parties involved to pay to maintain the road and to settle the legal status of the road. Thank you for a fascinating discussion from which I have learned much. You have yet again published WRONG LEGAL DATA. That is not the final decision. Burch/Redwood Empire lost the case and the road was deemed PRIVATE. Money was paid to the property owners, of which I was one. We filed the lawsuit, even though the court decided to list Burch. Contact Attornry Richard Van’t Rood, local to you, for confirmation. This is the last time I tell you this. YOU are not a lawyer. Contact the head lawyer, Mr. Van’t Rood to help you understand. Stop this nonsense.